Q. What do you remember from the 1979 revolution? A. I was about 7-years old. The only thing I remember was that the Shah had left the country and Khomeini took over. Both our neighbors had children. One was a Mojahed and the other was a leftist. Both were executed. I also remember the Islamic Komitehs. They were very active and would engage in writing slogans on the walls -- among other things. Q. When did you leave the country? A. I left Iran via Turkey about seven months ago. I went to Germany with help from the Heinrich Boll Institute and the Green Party. I have been in the United States since November of 2000, touring and lecturing. Q. Describe the events that led to the July 1999 incidents at Tehran University. Were you a student at the time? A: Yes, I was a student of literature at Tehran University. After the imposed Cultural Revolution by the Islamic regime, which took place at the universities [after 1979], a secular group was formed, called the "Iranian Intellectual Students Group." In 1997, the first student movement took place in Tehran's Amirabad area. Manouchehr Mohammadi was our leader and close to 10,000 students participated. At the beginning, our demands were non-political. We were demanding better food and housing conditions. In fact, we were using this as a pretense. We wanted to protest by dumping food during lunch break. Unfortunately chicken was on the menu for that day, which was a good meal compared to the other stuff on the weekly menu! This was the beginning of our exposure and people abroad noticed that there is a movement within Iran that is slowly forming. Security forces attacked us by bayonets and other means. And reports were echoed outside Iran. In 1998, Manouchehr Mohammadi and myself came abroad to see the political climate within the opposition. We were really disappointed; and were accused of having various affiliations. They threw tomatoes and eggs at us and claimed that we were agents of the Islamic Republic. Within Iran, Kayhan and Shalamcheh -- both ultra-conservative dailies -- published articles claiming we were acting as spies for foreign governments! They were also alleging we had asked for political asylum. In fact this was an ultimatum -- it meant that we should not go back to Iran. But we went back anyway. They took us to the special military wing of the Intelligence Ministry prison, where we were interrogated repeatedly. We were released after a few days. We decided to get an office and formed the first student committee in support of political prisoners, specifically in defense of Abbas Amir-Entezam (the longest held prisoner of conscience in Iran). In our first statement, we warned everyone of a gradual coup that was taking place in Iran, whose main target was the students and intellectuals. This was just before the serial murders of 1998. At this time, the National Coalition of Iranian Students and Alumni, was formed from three different groups. Our demands were secular and democratic. In May, we went to Ahmadabad on the occasion of Dr. Mossadegh's birthday. There were many students who were left behind due to lack of transportation. We could not afford transportation for all. There were clashes with the Islamic thugs and many were taken and transferred to hospitals. There were other events like the gathering at Laleh Square. 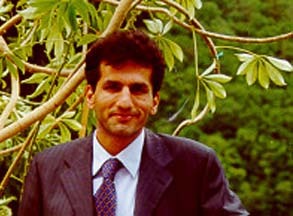 Mohammadi was abducted. On the occasion of 2nd of Khordad, we gathered to protest the regime's policies and defend freedom. To our dismay, the Khatami government branded us as rebels. In fact, the government refused to meet with us. At this time, ironically, other Islamic student groups were allowed to participate in demonstrations. But in this gathering, we sang the Iranian national anthem, while the other group sang the Islamic Republic's anthem. We demanded to see a representative from Khatami's office, but they refused to meet with us and called us rebels! On the 9th of Khordad, we held another protest. This time, the Hezbollah warned that if Mohammadi spoke, they would tear him to pieces. I spoke instead, and two plain-clothe dmen came and started beating us. They put us on a bus and transported us to prison while beating us reapeatedly. There was marshal law all around the Tehran University, and no one was allowed to leave or enter the university grounds. After a few days we were both released. Plainclothesmen of the security forces started breaking everything in their way. They ransacked our dorm rooms and started brutally beating everyone. From left to right they would attack us. And they threw a student from the balcony. They also shot another one. We were all in a state of shock. Couldn't believe our eyes. Five students were killed. And many more were injured. Four hundred were arrested. This was their revenge for our previous actions. The next day, the students gathered again and we started to march towards the university alley (Kouyeh Daneshgah). The Interior Minister had come to speak to us, but the students took his turban and didn't allow him to speak. We were all so angry and rightfully so. On Sunday, there were close to 25,000 students who started walking outside the university campus. More students joined and at this time nearly 50,000 young people had formed the largest gathering since the days of the revolution. In and around the university campus and all over the city, there was a state of siege. There were revolutionary guards and special university security forces everywhere. There was no sign of the Ansar Hezbollah. They would not dare show their faces. Q. Were you arrested during this march? A. Yes, It was during this protest march that the Mohammadi brothers, Manouchehr and Akbar, and myself were arrested and taken to Towhid Prison. We were badly beaten. . We saw and heard others being tortured as well. I could recognize the voice of Akbar. He was severely tortured while defying the Islamic regime and refusing to ask for a pardon. Moreover, he has undergone constant psychological torture after being sentenced to death. Every night his jailers would say to him, tomorrow morning is the day. Akbar has lost the use of one kidney and his hearing is now impaired. His sentence has been reduced to 15 years for "leading the rebellion." He has denied all charges. Lying on a flat bed while both of my hands and feet were tied, I was lashed on my feet. And then the guards would put salt on my wounds and make me walk. I could only crawl. In order to humiliate me, they would say, "The anti-religious figure must dance, must dance". There were usually a group of 4-5 people who would conduct the tortures. Sometimes their mobile phones would ring in the middle of the torture session. And they would do business deals on the phone. Sometimes, they tortured the Mohammadi brothers in front of each other. There were so many other brutalities against other fellow prisoners that it makes one sick. After the torture sessions, while I was being transferred to another room, as we were going up the stairs, a young woman shouted to me, "Do you know what they have done to me?" In my own physical and mental condition, I was feeling sorry for myself, and her voice was so shattering. This image has stayed with me ever since. I can hear the moaning and voices of so many prisoners next to my cell. Q. What is your opinion of President Khatami and the Majlis? A. You know, the Iranian people voted for him and we also gave him a warning. We emphasized the importance of the separation of state and religion. Even though Khatami's ideas were different from ours, we gave him the benefit of the doubt and supported him. We thought this would be a bridge for the realization of another goal. To achieve real freedom and a secular form of government, to hold a referendum and create a constitution that embraces everyone, where the individual and social rights of the people are respected. That is why we voted for Khatami. That is why over 20 million voted for him. But we didn't see any results. Khatami does not believe in a secular form of government. At best he wants a kind of Islamic democracy. Islam and democracy do not mix. Islam represents an ideology. He also says those who negate the present constitution and want a referendum are traitors. He called the students"rebels, traitors, spies, etc"; and his popularity has plummeted drastically. Nowadays, he goes to Persepolis and takes photos there. The same place they wanted to destroy. He does not believe in the will of the people. People do not want a theocracy. This regime is doomed. And they know it. The right wing of the regime, individuals like Khamenei and Rafsanjani, are alienated and already exposed. The problem we have is the left wing of the regime, the so-called reformists. They claim to represent the people. They are the same group who had the power and misused it during the first decade after the revolution. They witnessed or had a hand in the executions and crimes against so many innocent people and they did nothing to stop it. Now all of a sudden they are for reform. Those like Karoubi, Mohtashemi, Khoeiniha, Khalkhali, etc. -- they have now become the caretakers of the people! It is all a sham, a face-lift. This regime cannot and will not be reformed because it is corrupt from within. We say, a new referendum must take place and the Iranian people should have the right to choose their desired form of government, which will certainly not be an Islamic one. People want religion out of government. They want religion and Islam to stay pure and separate from the state apparatus. Q. And the Sixth Majlis, what has it achieved? A. Basically nothing. Because they are not the true representatives of the majority of people. They were handpicked. Let's see what they promised and what they have delivered. They promised to investigate the serial murders case, they promised to find and try those responsible for the dormitory incidents. They said the press would be free. They said they would make changes to the constitution. But none of that has been realized. Only a few people were tried and sentenced while the real instigators of the serial murders case are still enjoying full privileges as high ranking officials of the Islamic government. All those involved in the beatings and killings of the students have been freed or charges have been dropped. No changes in the constitution has taken place, and as we are witnessing, all the free newspapers have been shut down. As a matter of fact, they are not allowed to discuss the matter further. Q. Some intellectuals abroad say Khatami cannot do much. He is helpless while the main arteries of the government are in the hands of the right wing. A. In Iran, we do not think Khatami is a bad person. He is just not courageous enough. It is not enough to be honest. You must show courage in the midst of turmoil. And he has not. He had a majority of the people's vote. Reformists and the Jebheh Mosharekat have over 105 members in the Majlis, and Mr. Khatami speaks of a mardom-salari dini or religious democracy. We do not believe that is possible. Iran is not an Arab country. We have a different heritage that is not Islamic nor religious. We are not like Arab countries; our culture and people are different. Such a Islamic democratic state might work in other Middle Eastern countries but not in our country. And there are those in the West that are proponents of these ideas. We are totally against such ideas. Q. What is your opinion on the state of the country today? A. Today in Iran, a form of renaissance that occurred in Europe has already taken place. A sort of social and cultural revolution has happened. We are now in need of a political revolution. Secenty-five percent of the people in Iran are young and they hold the key to the future. They see the world differently and are moving very fast. Our society is more than ever ready to enter the 21st century and I believe with individual freedom, we will achieve the goals we have set forth. I have a lot of confidence from being and coming from my homeland. The era of backwardness is nearing an end and the youth of Iran are at the forefront of this battle against ignorance. And others will follow. Q. What is your opinion of the current movement abroad and what do you recommend to your countrymen and women outside Iran, especially the so-called second generation? A. There are those who still want to use force and violence to combat the regime; and see revenge as the only answer. We are against such mentality. We must build an Iran not upon destruction, not upon killings and violence. We must build an Iran that is upon goodness. We must create a society, which will not allow torture, execution, stoning, and humiliation of individuals. Where there is social justice for all. Where there is freedom of pen and thought. And the gap between the haves and havenots will slowly disappear. There is another tendency, which uses reform to make its point -- those who were against elections at the beginning but now not worship Khatami as a savior. They give advice to the people that they should keep still and wait for a miracle. They are wrong. The Iranian people are in the middle of a fast moving stream. They are independent of these thoughts. I will say with confidence that today the Iranian people are running at the speed of 100 miles an hour while Khatami and his followers are running at 20 miles an hour. People are ahead of them. Time will only tell. And time is on our side. We just say to the Islamic regime that do not give anymore advice to the people and do not dictate their destiny.People are capable of being responsible for their own future, after two decades of injustice. My only recommendation to my fellow Iranians abroad is to set aside your differences and gather around a common platform for the good of the country. Find a common ground and work on that. The main enemy is there and in order to fight it we must become united. That is the only way to emancipate our homeland; to free our people. I say to them, help your fellow Iranians by any means you can. Use your resources, both financially and morally to help them. And forget past differences and animosities. Now it is time to help those who are in prison, under torture and the ones who work so hard to make a living for mere survival. History is the best judge. Let us not put blame on each other but let us stay on the correct path vis-à-vis the future generations. How can anyone of us face the people? We must stay loyal to them by supporting their cause. Q. Is that why you have come to the U.S.? A. Yes. You know I was in prison for six months. First, I was in solitary in a 1m x 2m cell. I saw sunlight after three months when for the first time I was allowed to see my family. After my release, I was fired from my job at the Water Company. Additionally, I was expelled from the university where I had hoped to study marketing. That is why I left to seek the help of my fellow Iranians abroad and bring to their attention the terrible conditions in Iran. In fact, if I had stayed I would be in prison today. They have arrested so many of my colleagues. They arrest them and then release them after setting an enormous sum for bail. The regime puts pressure on their families who are financially destitute but would do anything to see their loved-ones set free. Q. What is your assessment of the Iran's political future? A. My personal feeling is that events in Iran are volcanic. And what happens in Iran will surely affect the Middle East region. The majority of people do not want this Islamic form of government. And unfortunately a peaceful transition may not take place as we all desire. If this situation continues, people will determine their destiny in the streets. If Iran were not rich like some other third world countries, the situation would have been different. But we have a very rich nation with lots of resources. Tourism, oil, natural resources; we have the four seasons, rich soil, and on top of all that, a highly talented youth which comprise more than two thirds of the population who have tremendous will power and have learned a great deal from the past. We are not less capable than countries such as post-war Germany or Japan. We have the potential and all the tools to create a society where there is equal opportunity for all citizens, even better than many European countries. We must utilize the resources outside the country such as the thousands of experienced and highly educated Iranians and fill this economic and technological gap that exists with the people inside Iran. Do you realize that only 15,000 people hold 70% of the total wealth of the country? Do you know that there is only one medical assistant per 750,000 students? With so much waste by the Islamic foundations (bonyads) , which are in control of the country's wealth and are not even accountable to anyone, with mismanagement and corruption at all levels, we must work together to establish a government which will allow the flourishing of a healthy economy. And for the achievement of this goal, we need a free society. I have faith that as a nation we are ready and able. Akbar Mohammadi in a recent letter to Ayatollah Shahroudi, the head of Islamic Judiciary wrote: "Mr. Shahroudi, my confinement in prison over a period of 20 months while being innocent of all charges, is a total injustice even in the realm of your own judicial system. For those who have kept me in prison and who have never even allowed me to defend myself in a real court of law, this act is inhuman.. But if there is an Almighty God who listens to the cry of the innocent, I will come out as a victor. In the history of mankind, no injustice has been unanswered. The reason for my imprisonment by the Intelligence Ministry is that I have resisted torture, and I am the brother of Manouchehr Mohammadi. "It should be recognized that I, Akbar Mohammad and others, will continue our resistance at any cost. Even though, I have lost the use of my kidney, even if I have lost my hearing, if my bones ache from constant beatings, and I am not able to walk easily, to prove my innocence and defend my rights, in this Evin prison, I shall still cry out to the world, 'Long live Iran. Long live freedom. Justice shall prevail."